Dr. Linda Hunter is from Albany, NY. She has a B.S. degree in Animal Science and a DVM degree, both from Cornell University. 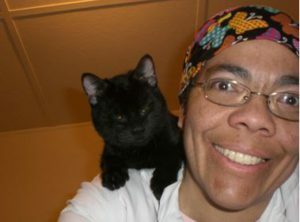 She worked as a small animal veterinarian in the Albany area, and later in Buffalo, NY. Linda left Buffalo to pursue Shelter Medicine at the Humane Society of Charlotte in North Carolina. She later returned to Cornell University for a PhD in genetics where she studied the inheritance of eye diseases in dogs. Linda joined the SOS team in 2015. She has 6 cats and enjoys reading, gardening, travelling, nature and photography.